It has been preeeetty cold around these parts the last week. I’ve been getting a ton of use out of all my favorite blanket scarves, this one in particular. 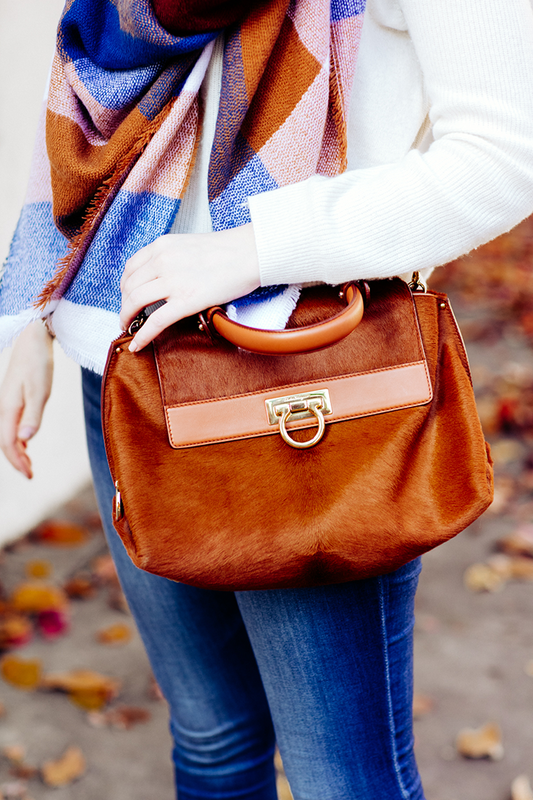 It looks fab with my favorite boots and cognac bag, don’t you think? The color scheme is so rich and pretty! I love being able to style it as a wrap/cape like I did here, but also wearing as an oversized scarf. So useful and versatile! PS – it’s only $33. I’ve never really worn Hudson jeans before, but I got gifted this pair and this pair for Christmas and they have been on heavy rotation ever since! This pair is the perfect shade of blue for this time of year, and this pair is the ideal black skinny style. If you saw my Instagram last week, you’ll know I just purchased this cozy grey sweater. I love how the neck is a mock style vs turtleneck (my hair stays neat! ), and the subtle cable-knit detail down the front adds a little texture. I also got it in black! This sweater is only $78, by the way. I also picked up this tunic-length sweater – it’s the perfect relaxed vibe I’m looking for in an everyday sweater. It comes in five colors and is under $100! That scarf is beautiful! I love how you styled it! Looove your scarf! Perfect for these freezing Dallas temps! The perfect weekend look! 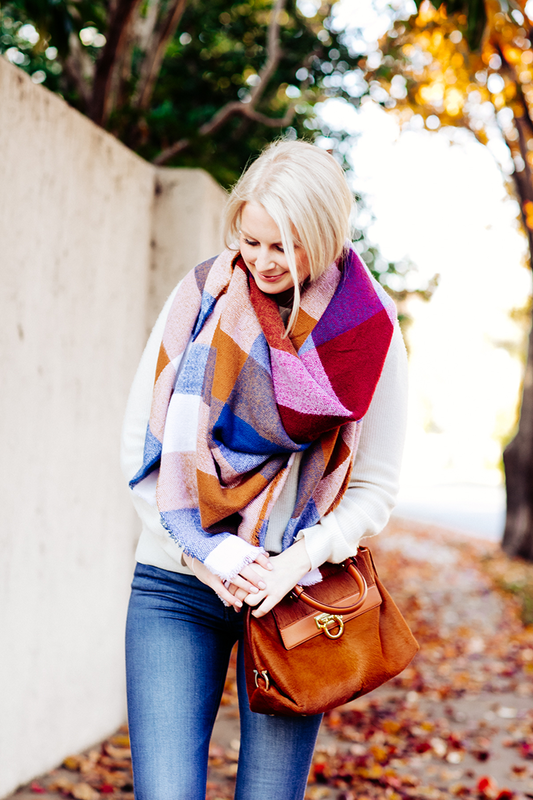 Love that cozy checked scarf and I’m dying over that Ferragamo bag! Such a cute scarf at a great price! What a cute scarf! I love that you incorporate whites and creams into your winter wardrobe. Who ever said they were only for summer? That scarf does look fab with your boots and bag. I love that bag! It got super cold here this weekend too. Yikes! 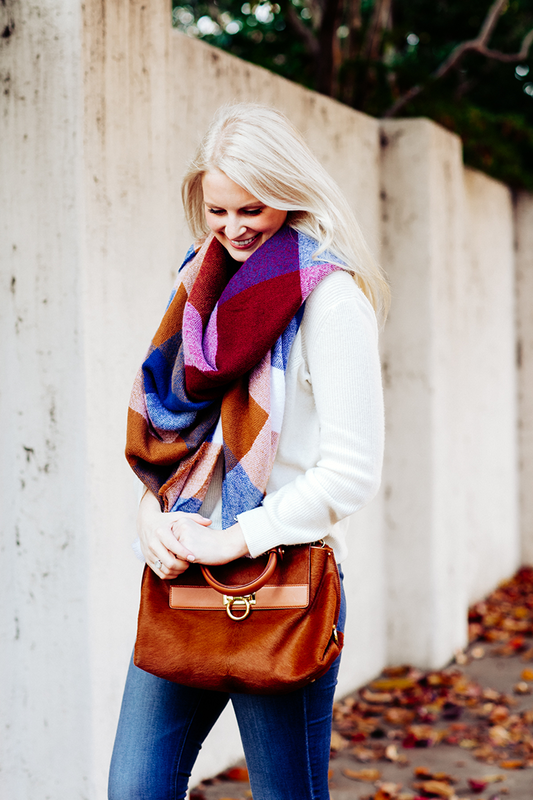 I love be the colors in your scarf and that bag is just st gorgeous! Happy new year Merritt! I love this check pattern, so pretty! Love, love the colors in this post! You look beautiful as always.